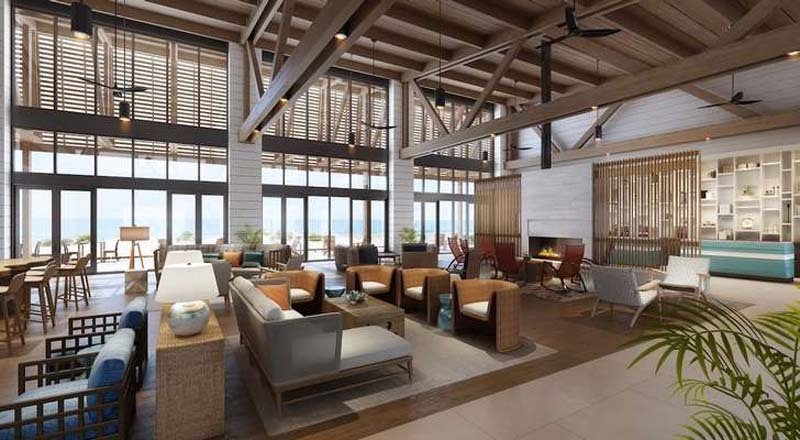 Almost 15 years after the original property was badly damaged by a hurricane, the Lodge at Gulf State Park has returned, completely rebuilt and featuring numerous eco-friendly initiatives. The 350-room beachfront property, located within Alabama’s Gulf State Park, incorporates a long list of sustainability measures including 15 percent of the building’s materials being recycled material and 70 to 75 percent of the construction waste being recycled. The property also features responsible water sourcing and routing. For example, condensation from its HVAC system is collected and recycled to replace water in the property’s pool. Rainwater is also collected and then directed to a restored wetland on site rather than being sent into storm sewers. The hotel’s parking lot, meanwhile, is permeable, made of TrueGrid technology that allows rainwater to drain into the ground. The Lodge at Gulf State Park also includes several wildlife conscious features. Some hotel lighting, for instance, incorporates shielding so that it does not disturb nearby turtle nesting areas. Lights on the beachside of the property are warmer, to be less confusing to wildlife. Floor to ceiling glass windows in the main lobby has been designed with bird-friendly safety measures. There are also some notable energy conservation measures built into the reimagined property. Guest room air conditioning units were installed with sensors designed to shut off the unit if balcony doors or windows are left ajar. The full hotel is equipped with energy efficient lighting and motion sensors to reduce waste. The grounds surrounding hotel building feature restorative landscaping. About 75 percent of the site was dedicated to using native species that thrive without irrigation, chemical pesticides or fertilizers. “By planting native species, the coastal landscape is restored, and habitats have been created for native birds, nesting sea turtles, and the Alabama Beach Mouse,” the company said in a statement. Still, more measures are focused on food and waste reduction and conscientious menus. Work on the reimagined hotel was led by LakeFlato and Rabun Architects, and the native landscape was created by Sasaki Associates. Additional admirable details include the building’s footprint being reduced by nearly one-third and set back about 200 to 225 feet from the Gulf to allow for greater dune restoration and natural dune movement. The buildings are also positioned to take advantage of gulf breezes for natural ventilation and to maximize natural lighting of the interior. The Lodge at Gulf State Park is the first full-service hotel to open in the area in 20 years.